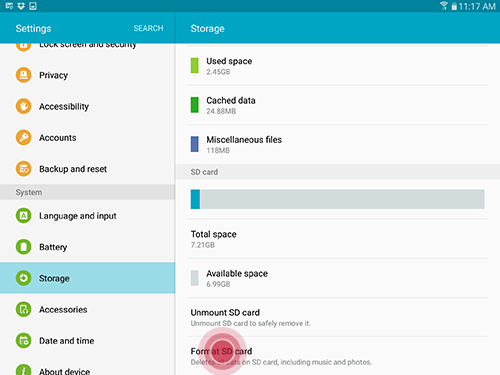 You can use a microSD or microSDHC card (not included) to add additional memory space to your device. Note: When formatting an SD card, you will want to backup your music and photo files that are stored on the card because formatting the SD card deletes all the stored data. 1. 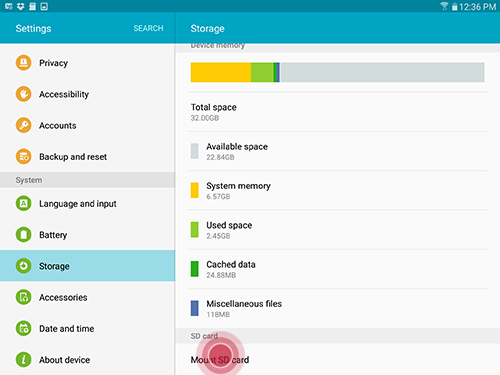 From the Home screen, touch Apps > Settings > Storage . 2. 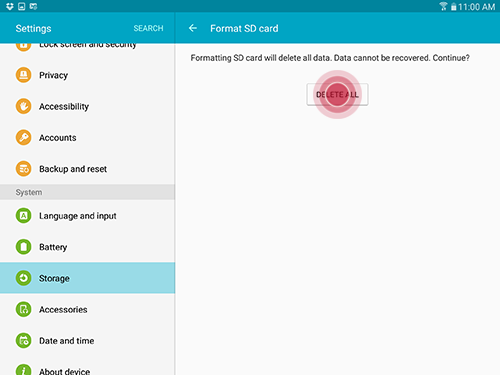 Scroll down and touch Format SD card and follow the prompts. 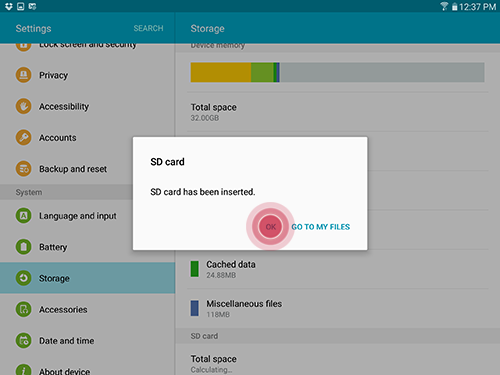 3. Review the message and tap FORMAT SD CARD again. 4. Tap DELETE ALL to start formatting SD card. Important: To prevent damage to information stored on the memory card, always unmount the card before removing it from the device. 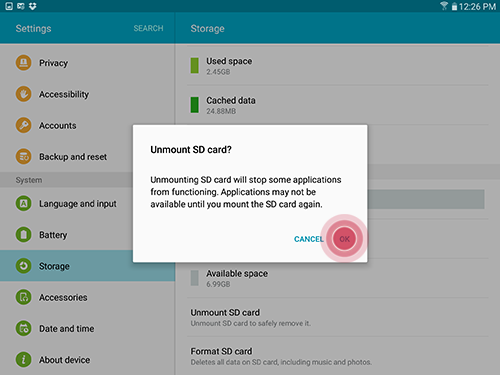 Unmounting an SD card may stop some applications from functioning until you mount the SD card again. 2. 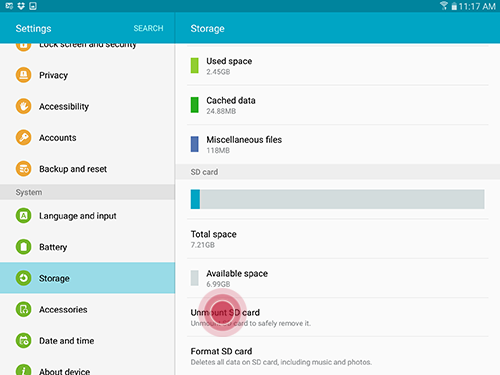 Scroll to and tap Unmount SD card. 3. Tap OK to unmount SD card. 4. Insert the ejector tool into the hole in the microSD card tray on the side of your device, and gently press the tool until the tray pops out. 5. Remove the microSD card from the tray and insert the microSD card tray back into the device. 2. Scroll to and tap Mount SD card. 3. Tap OK to finish mounting the SD card. Important: The following information is for advanced users regarding NTFS and FAT file systems. It is explained with the assumption that prior experience is available and will NOT review basic information. As a result, certain terms and instructions may be found confusing. It is not recommended to continue if you do not consider yourself to be an advanced user. Click here to expand the topic. •By default, Mac computers can read NTFS drives, but cannot write to them without help from external software or changes made by command prompt or terminal. •If an external device is formatted as NTFS, it is absolutely necessary to use the “Safely Remove Hardware” feature to remove the device. Failure to do so may corrupt the files it contains. •FAT is ideal for external drives because so many devices support it.